I have been making a version of this dish for years. It is a perfect mid-week meal – easy to prepare, super tasty, it all happens in the one pot so there isn’t a lot of clean up, and it’s always a hit. Heat a frying pan over medium heat and and add the oil, cumin, cinnamon and curry powder. Stir to combine and add the mince. Stir until cooked through. Add the quinoa and stir to coat. Add the stock; bring to the boil. Cover, lower heat to as low as possible and cook for about 12 minutes or until the quinoa is cooked through and the liquid had been absorbed. Add the tomatoes and currants; cover and let sit for 5 minutes. Stir through the chopped parsley reserving a little for garnish; serve with a good dollop of natural yoghurt. Connecting from BlogHer… Gorgeous photos and blog! Pinning this one! Mmmm lamb in a quinoa pilaf? This sounds sooo good! 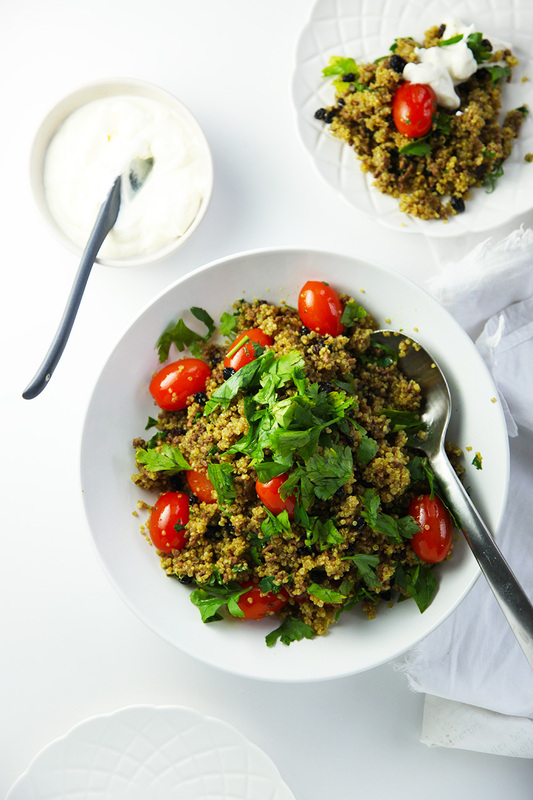 I love quinoa and I love how simple this recipe is! Beautiful pictures too! My husband and I both love lamb. I wish I would have seen this blog yesterday because we just had lamb last night….I’m bookmarking this to make the next time we have lamb on the menu. Good simple ingredients pulled together into an interesting dish. What’s not to love? I love the sound of this dish but will probably have to make it with Beef, lamb is incredibly difficult to find here… The last time I was able to get it I had to buy one that was still bleating (I ‘kid’ you not)! wow , looks so healthy! !